The Miami Dolphins dominated their first meeting of the season against the New York Jets, winning 23-3 at MetLife Stadium. DAVIE, Fla. — Dolphins offensive lineman Bryant McKinnie recently texted Ravens running back Ray Rice with some vague trash talking. A Baltimore player has been staying at McKinnie’s place in the city since an Oct. 21 trade sent the former University of Miami player back to South Florida. In the text, he wrote: "Can you make sure he’s out Jan. 1 because you guys aren’t going to the playoffs." "At this point everybody has to look at every game as you don’t know if it’s going to be your last game or not," McKinnie said. "That’s always my attitude when I’m in the playoffs. You just have to look at this as a playoff game." Standing in the way of its first postseason berth since 2008 and second time in 12 seasons is the rival New York Jets. Sunday afternoon’s matchup at Sun Life Stadium will mark the 95th meeting between the two teams. New York (7-8) leads the series 49-46-1. "We talked to the team this morning about playing our best game of the year," Dolphins head coach Joe Philbin said. "We need to put together our best effort in all three phases of the game. It’s as simple as that." On Dec. 1 the visiting Dolphins dominated in a 23-3 victory. Over the past two meetings — both wins — they have outscored the Jets 53-12. Miami has won three of four. Earlier this month the offense netted a season-high 453 yards. 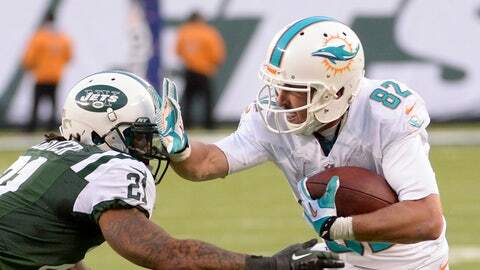 The ground attack produced 125, while Ryan Tannehill passed for a season-high 331 yards and two touchdowns. The Dolphins recorded four sacks, six passes defensed, four tackles for a loss, six quarterback hurries and three turnovers. They allowed a season-low 177 yards on 10 first downs. Jets quarterback Geno Smith went 4-for-10 with 29 yards and one interception in that loss. Smith, from Miramar High School, will get to play in front of family and friends. At West Virginia he routed Clemson, 70-33, in the 2012 Orange Bowl at Sun Life Stadium. "I’m sure he’s going to come in here with a chip on his shoulder — show his fans what he can do — but at the same time we have a mission and our job is to go in and stop him," defensive tackle Randy Starks said of Smith. "They’ve been playing good since we last played him. We expect their best shot." Since that loss, the Jets have won two of three games. A victory would even their record during a season when the team lost seven starters on both offense and defense. As for the hometown kid, Smith combined to go 36-for-61 with 433 yards, three touchdowns and just one interception in those two recent wins. "Obviously we couldn’t do anything against them in the first matchup," Jets head coach Rex Ryan said. "He’s definitely playing better. I think our team’s playing better. Certainly we recognize we have to play better this week if we expect to go in there and compete against these guys. Philbin gave the team Christmas off to spend with their families. Players will return to practice on Thursday to continue preparation for its biggest game of the season. "I’ve been in the position of spoiler before — we’ve all been — it’s a game where you use that as your motivation," defensive end Jared Odrick said. "We understand where they’re coming from, and we can’t allow that to happen."